LSBU architecture graduate, Shigemi Challand, has had her unique sculptures selected to exhibit at a prestigious gallery in London. 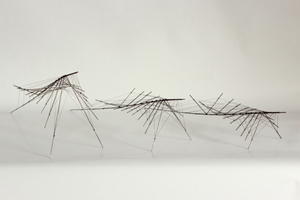 Shigemi Challand's sculptures in steel wire and cotton thread are informed by her architectural thinking. Two pieces of her work are on display in a collection of contemporary art at the Medici Gallery, which was established in 1908 and has been in the heart of London's Mayfair for over one hundred years. Shigemi was born and grew up in Japan before relocating to the United Kingdom in 2000. She graduated from London South Bank University with a first-class Bachelor's degree in Architecture in 2008, followed by a Postgraduate Diploma in Architecture for which she was awarded a distinction. Whilst at LSBU she was twice nominated for the prestigious RIBA President's Medals student awards and is now in practice as an architect and interior designer, with a keen interest in sculptural forms. In 2014 her work was also included in the Open House London weekend – billed as the capital's greatest architectural showcase. Architecture postgraduate course director Lilly Kudic said: "Shigemi was a genuinely exceptional student. Her work with experimental structures is both delicate and highly practical, and realised through the use of intricate physical models. The genesis of this approach lies in her postgraduate work at London South Bank University, committed to the principle of design as research." The Medici Gallery exhibition runs until 9th December 2014.